Returning home from an incredible all-inclusive vacation at Hyatt Ziva Rose Hall can be rough. But if you’re missing the zesty zing of Jamaican cuisine, we’ve got just what you need to spice up your dinner rotation. 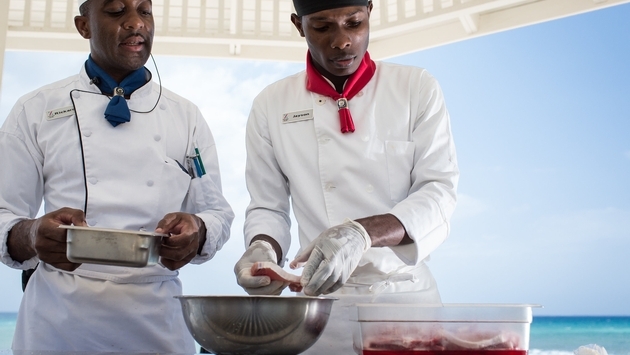 Hyatt Ziva Rose Hall’s Chef Rickardo Foster has shared the resort’s authentic Jerk Pork Chop recipe so you can bring the flavors of the island to your kitchen table. Just make sure to plan ahead as you’ll need a few days for the ingredients to combine for the perfect tangy flavor. 1. For starters, you will need to create your Rose Hall Jerk Sauce in advance. To prepare your Jerk Sauce, place all the sauce ingredients into a food processor or blender and liquefy. 4. Grill each chop for approximately 12 minutes. (Chef Foster recommends a BBQ Smoker Grill.) Baste the chops with beer to enhance the smoked flavor during the cooking process. 5. Serve and enjoy with your favorite side dish and an extra side of Rose Hall Jerk Sauce. That’s all there is to it! Now you can whip up a true taste of Montego Bay at home! Be sure to share pictures of your dish below.